Baking traditional German handmade sweet and savory cakes - with crossovers to Austria, Switzerland and Alsace. Each artisanal cake is handmade and made to order, using high quality organic, natural ingredients and a few imported specialty ingredients from Europe. Our traditional handmade Stollen and Christmas Cookies can be purchased and shipped throughout the US via the Shop tab. They also make a perfect corporate gift for your clients. we are in our seasonal BREAK. See you back for the 2019 holiday season. 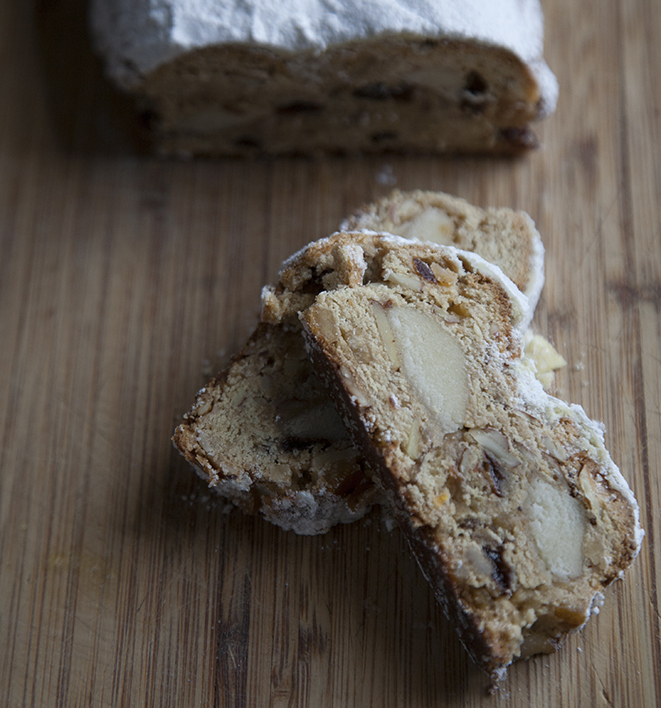 Our Stollen recipe is a mix of 2 grandmas recipes - a friend’s from Dresden and my Oma's. For 6 months, we developed our Stollen recipe, tested it on German/European Stollen-Lovers, and only started producing them here in Brooklyn after we got a 100% approval rate. We use mainly organic ingredients as well as a few speciality ingredients such as the Rum from Austria, Marzipan from Germany etc. We keep it real — as real can be – including the slow process of production, giving the Stollen their time within steps of the production process, aside from their resting time. Each Stollen is handmade, with love. Back in 1450, Stollen were to be eaten in the Advent-Time — the time of fastening. During that period of the year, the Pope of Rome was prohibiting the use of butter. Oil-only, resulted on bland Stollen that were as hard as stone. After several attempts over 40 years from Prince Elector Ernst and his brother Duke Albrecht of Saxony to intercede in favor of butter, in 1490, Pope Innocent VII signed a bill renowned as “The Butter Letter” authorizing the usage of butter – only its use was only free of fine for Prince Elector and his family without paying a fine. The others were fined a 1/20th gold Gulden. The Stollen symbolizes the ‘Christkind’- the child Christ - wrapped in white cloths. After baking, buttering and sugaring, the Stollen need to rest so the flavors can blend and develop. I call it their ‘beauty sleep’. Since centuries, there are discussions on how long they need to rest —some say 2 weeks; others prefer 4 weeks. I agree with the latter: in my eyes, 4 weeks is the minimum to let them ripe and reach perfection. To that extent, Stollens are like good wines and good cheeses. And just like them, they also need to rest in a cool place. The butter and sugar coating act as a natural conservation to seal the Stollen. In Germany, some people eat their Stollen up until Easter. If you plan to do so, we recommend you freeze your Stollen til then. Our grandmothers usually kept the Stollen on top of their wardrobe in their bedroom, as this was usually the coolest room if no cellar was available. It also prevented kids from reaching them – and feast on them before the holidays.Yet, today, a wine-fridge is a perfect solution. How to keep a Stollen? Think wine cellar. You need a cool room, around 62 F or below, and out of reach of sunrays. Never keep it in the fridge – it’s too moist – yet you can freeze the Stollen and thaw overnight at room temp to extend shelf-life. Once open, keep in an airtight container. How to cut a Stollen? Always cut from the middle towards the edges, and move the two parts together to retain freshness. How to eat a Stollen? Traditionally, it is eaten after a meal, as a dessert— along with some Portwine or Sherry— or in the afternoon, with a cup of coffee or tea. It’s also great for breakfast, and especially with—guess what?— another piece of butter on top. Additionally, you may also crumble it up, and put it in a layered custard dessert, or sprinkle it over ice-cream. There are no limits. Check out Food & Wine's Article about our Christmas Cookies and Stollen. Sign up with your email address to receive news and updates about our 'BackTag' Baking Days.